With this Sunday, 11 November, marking the centenary of the armistice that brought an end to the First World War, Paul Symington shares a letter from his grandfather Maurice, that was written shortly before the Somme battle and to be sent to his father in the event of his death. Born in Porto in 1895, Maurice signed up in 1914 with the outbreak of war and joined the Royal Field Artillery. 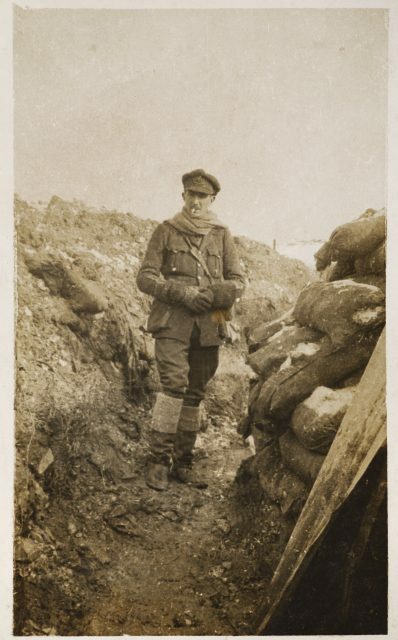 In late June 1916 while stationed in Béthune on the Somme, newly turned 21, the young lieutenant wrote his father, Andrew, a letter which was to be sent home should he be killed in action. It is the sort of letter that was written many hundreds of thousands, even millions of times that year, and the year after and the year after that, as it had been for the previous two years before. It was written again countless times a pitiful 20 or so years later throughout the following six years of the Second World War. It is written still. To A. J. Symington Esq. This is my ‘despedida’ to you, for if you get this I shall have been killed: I am writing today as I may not have another opportunity, this being the first day of what I expect will be the biggest attempt yet made on our side to break through the trench system and force conclusions. The main attack will not be on our front, but there is to be liveliness all along the line, beginning today, and naturally there are bound to be casualties from it. There is no need for me to make a will, not having any property worth speaking about. What there is I leave it to you to divide as you think best. I don’t want my name to become ‘poor Maurice’ etc spoken in whispers and to introduce a gloom. After all it is the best death one could die and you ought to be proud that one of the ‘família’ figured in this war, though naturally I have no hankering after glorious deaths and would far sooner remain alive. I sincerely hope I will, but one can’t arrange these things. Two more requests which I hope will someday be carried out. The First is, that as presumably all or most of you will eventually be buried in Agramonte, I should like, as I can’t be buried there myself, to have my name stuck in somewhere just to show that I did belong to the família that I am so proud of. Just a line to say that I was killed in action in France; so that all our names at any rate should be together. The other, and more far-fetched wish is that one of you – Edgar, Mabel or Twins, for preference the first or last as they will remain Symington, should among their children find room for a Maurice. It isn’t a bad name as names go, and then someone at any rate would remember me if only by name, as being the fellow he was called after. I should like £10 put aside to get this kid some sort of ‘lembrança’ of the fact he was called after me, say a silver mug (such as I never had) or something of that sort. Queer ideas, I grant you; but sit down and write a goodbye letter and see what queer feelings and wishes you find come to you. No need for me to say how sorry I am that after losing Mother, you should have this further trouble, more especially as you had worked so hard to get me that splendid chance in Silva & Cosens and Warre & Cº, which I had looked forward so much to going into. I should like Masses said for me. If Mother had been alive she would have seen to that, but at any rate she will be over there herself instead. The Battle of the Somme began on 1 July. By the battle’s end on 18 November over 400,000 British and Commonwealth troops, 200,000 French and between 430,000 to 500,000 Germans had been killed or wounded. Maurice was not among them. In 1918 he was made a liaison officer with the Portuguese Expeditionary Force and eventually returned home to Porto and, in time, ran the family business himself. He died in 1974, aged 79. Maurice’s letter was never sent. Many were. They are still.